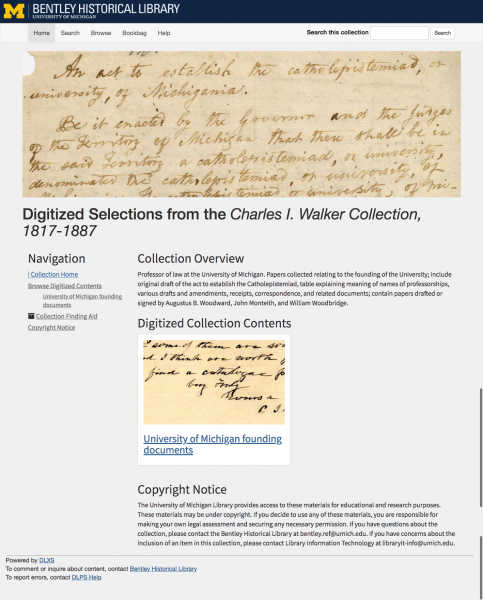 Over the past year, Library Information Technology - specifically Digital Content & Collections, Digital Library Applications, and Design & Discovery - has been collaborating with the Bentley Historical Library to assess and update the interfaces for some of the Bentley's digital collections. The results have improved usability, allowed us to document lessons learned that can be applied to the new digital platform that we are building for our digital collections, and forged deeper ties with a great ally, the Bentley Historical Library and its staff. The first phase of the project took place in Summer and Fall 2017 and focused on conducting user studies of what users, both students and Bentley staff members, found easy and difficult about the collection interfaces. Findings from the usability testing included noting that users wanted a clearer hierarchy of where they were within the collection as they were searching or browsing. Changing font size to differentiate key parts of the page and adjusting alignment within the page were identified as quick wins. Major changes like allowing images to have a greater role within the collections instead of just the text were considered to be larger technical changes and some were identified as technically infeasible for the time being. We documented usability findings, and even if we were not able to implement improvements in response to them, we will keep them in mind as we begin to build the new digital platform that hosts all of our digital collections. In the second phase of the project, beginning in Spring 2018, we applied the lessons learned from the recently completed usability testing to implement changes to the interfaces. In discussing what recommendations to implement and which ones would need to be set aside for now, we found that one of the major recommendations, which we had thought would be technically too difficult to implement, was actually possible to achieve now. By extending the repository IIIF API to support the text collections, we were able to offer thumbnail images in page listings (search results / contents), and provide a similar experience to that found in the Michigan Daily Digital Archives digital collection: zoom-able/pan-able image views presented with the OCR text. While the OCR of the images can be less than ideal, the added visual information allows for greater user engagement and understanding of the archival materials. The changes were finalized recently, and the results can be seen in the before and after images for the collections below. The images below capture what the main collection pages looked like before our changes and afterwards. They do not capture the increased functionality of the collections, so please click on the collection links to explore them in more depth. This project required a lot of time and work from many people from Library Information Technology and the Bentley Historical Library. Thank you in particular to Chris Powell, Roger Espinosa, Ben Howell, Bridget Burke, Heidi Burkhardt, Jonathan Earley, Michael Shallcross, Dallas Pillen, Max Eckard, and Cinda Nofziger!